The popularity of cameraphones has led to a decline in the sale of wallpapers and phone graphics, a survey has found. Increasingly people are personalising their mobiles with pictures they have taken themselves rather than paying for content found analyst firm M:Metrics. It means graphics publishers will have to work a lot harder to capture consumers' attention, it predicted. The flip-side for mobile operators is that people are more willing to pay for data services and photo messaging. "While a cameraphone in the pocket of most mobile phone owners may have picked the proverbial pockets of graphics publishers, the penetration of the technology has a positive impact on operator data revenues overall," said Mark Donovan, senior analyst with M:Metrics. Its research found that 20% of Europeans, and 14% of Americans now pay for data services and photo messaging bundles. Sending photos or videos is among the most popular mobile data service, with over 30% of mobile subscribers sending photos to other phones, e-mail addresses or blogs, according to M:Metrics. Three out of four European mobile subscribers now own a cameraphone. In the slower US market, there are now 160 million cameraphone owners, which is just over half of the total mobile market. "We have got to the point now where it is unusual to see a phone without a camera. 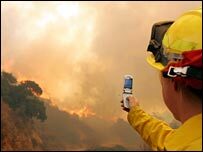 They can compete now with digital cameras," said Ben Wood, director of research firm CCS Insight. The rise of cameraphones has been meteoric. The first camera on a phone - Sony Ericsson's T68 - was introduced to the European market at the Cebit technology fair in March 2002. It had to be clipped on to the handset. The following year, Sony Ericsson showed off the T610, this time the camera was built into the phone. 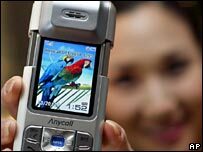 By the autumn of 2004, Samsung was unveiling the first 5-megapixel cameraphone, the SCH-S250. While multi-media messaging has not taken off as operators might have hoped, the increasing popularity of social networking sites such as MySpace and Flickr is boosting the numbers of people sending photos. Photo-sharing site Flickr has a new feature, listing the five most popular cameraphones. The Sony Ericsson K800 - is currently at number one. Mr Wood pinpoints the events surrounding the London Bombings - where citizen journalists provided the mainstream media with many of the images of the tragedy via their phones - as a turning point for cameraphone usage. Mobile phone operators are starting to offer affordable flat-rate data rates and this, coupled with the fact that handset manufacturers are increasingly embedding support for sites such as Flickr and Blogger, means there could be an explosion in the number of photos being shared with websites over the next three years, predicted Mr Wood.